Once you have started your own cleaning business and are ready to start gaining clients, how exactly do you go about doing so? Gaining customers through promotion can be tough if you’ve never done it before. But with the following 5 simple methods you will be gaining clients in no time. Before we get into the actual ways of promoting your cleaning business, I want to make sure you have set up your cleaning business correctly. If your business is not ‘official’ nor have you done the right steps to starting your own cleaning business, it can lead to failed promotion attempts. So before you start promoting, be sure you read up on starting a cleaning business the right way. Now that we have that all squared away, let’s get into the promotion methods you’ve been looking for! Using flyers may seem like some old, gimmicky tactic that no one uses nowadays. That is simply not true, the only thing you have to be sure to do is to properly place your flyers so they will be in front of your potential clients. So how do you properly place flyers so potential clients will see them? Simple, know who your target market is. Typically, it won’t be young college kids as they can barely afford food! Do some research on who can afford your services, and where they typically go. Then, go to those places and put up flyers or even hand them out, and your conversion rate will be much higher than just putting them randomly around your city. Again, this may seem really simple and something you probably already know about. But I want to stress the importance of business cards and what they can do for you and your cleaning business. Everytime I connect with someone, even if they may not be my ‘ideal’ customer, I still give them a business card in hopes that one day they will see it again and either need the service, or know someone who will need it. Another good tactic to do with business cards is to leave them on pin boards which companies put up so local businesses can promote themselves on. I know there is one at my local bank, but you will have to do your own research as they will be at different places where you live. Another thing, these boards are free typically as it is such a small (yet powerful) space. Now this one can be a bit tricky, as it not something you can physically do to gain clients with, like you can with flyers or business cards. Although, there are some good tricks you can do to help entice people to refer people to your business. You could offer customers a discount off their next cleaning service if they refer someone to you, as well as offer a discount for the people who are referred. This will not only gain you new client, but it will also entice people to use your service again because they get a discount on their next cleaning. So word of mouth is a very strong and powerful tactic you must always keep in mind, as your clients are much more powerful at promoting your cleaning business than you will ever be by yourself. Everyone needs to have a website these days. People are searching for just about everything online, and if you aren’t there to capture those leads then you are missing out on a lot! Websites are cheaper than ever before, you could even get yours setup at around $10-$20 if you know what you are doing. Having a website alone won’t be of much help if no one can find it. Be sure to include it on things like your flyers and business cards so there is another way to get in contact with you. Also, you may want to consider hiring someone to rank your website for local searches so people who search for “cleaning services in (your town),” you will come up first above all of your competitors. Now this idea can seriously bring in a good amount of leads if the area you live in has a lot of Groupon users. Groupon has tons of local offers, even for local home services! This is a perfect spot to put up a promotional offer for your cleaning services, and gain clients rather quickly. 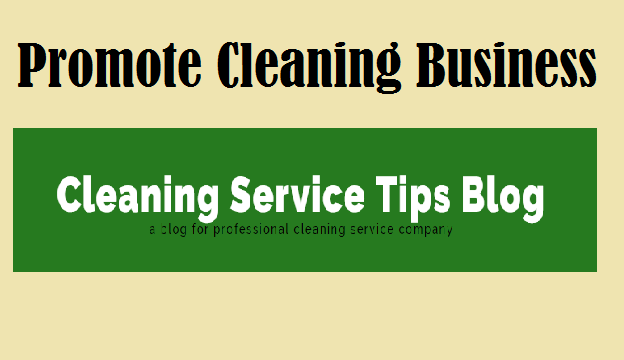 Be sure to create a good enough offer that people will actually want to try your cleaning services, otherwise it will not appeal to many people. You may even want to consider offering a “break even” deal. What I mean is, offer a deal where you will simply break even in profits for your first run with a client. I know, it probably sounds crazy but let me explain why you should do this. So let’s say you break even the first time you clean a client’s place, but the next time they schedule with you it is full price. You will have gain a loyal customer that keeps coming back, and all it took was one single break even offering. This is a very powerful tactic, and it will entice many people to try your service. That just about sums it up! With those, highly effective and powerful promotional methods, your cleaning business should be gaining customers in no time. Be sure to take all of my notes into account, and remember to just take action. You don’t need to do all five of these, but get started with one or two of them to get going. After you have proven your success with a few, move on to the others. Awesome post! I agree that word of mouth is soooo strong, especially when you offer things for people to spread the word!! Keep it up, loving this..